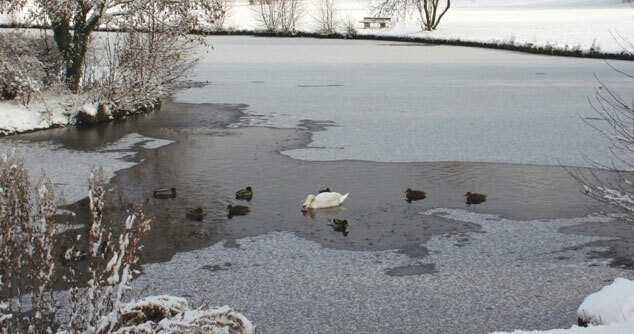 In freezing climates it is recommended to remove pumps from ponds and water features to prevent damage due to ice. Winterizing your pump will vary a bit by type of pump you have. We actually recommend that submersible pumps with mechanical seals (TH, TM, TLS, TB or other direct drive pumps) be stored in water up to just above the seals. The mechanical seal is located where the shaft exits the motor housing and enters the “pump” chamber. By keeping this wet the mechanical seals won’t experience a “drying” out. The outer casing of the pump can be cleaned at this time as well if scale or hard water build up is evident. A mag drive style pump may benefit from cleaning of the impeller, magnet and chamber. Remove the outer screens if applicable and the impeller cover/volute from the pump. Then carefully remove the impeller assembly from the pump. Inspect the impeller and magnet for debris or build up. Remove any build up with water, vinegar and non-abrasive rag or pad. Then carefully reassemble the impeller assembly and the outer coverings. A video that covers this process can be seen at our YouTube channel. A mag drive pump does not have a mechanical seal so storage in a dry, non-freezing location is adequate. Before re-installing the pump in the Spring, it may be a good idea to spin the impeller by hand to make sure the impeller isn’t “stuck” by sitting inactive for a few months. Obviously, the pump should be un-plugged when doing this. If you have any other questions you can reach our customer service at 800-448-2873 (Mon-Fri, 8am-5pm Eastern time).